I have discovered you can watercolor with almost any medium. Today I am using irRESISTible Pico’s. This is such a fun image to color and with the Pico’s, you can give the gumballs a little something extra. 1. Cut watercolor paper 4.0 x 5.5 inches. 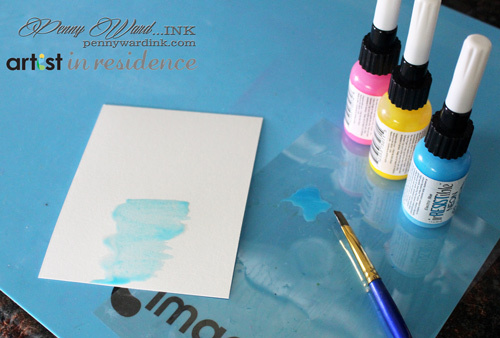 On craft mat, squirt about a pea size of Neon Blue Pico. Dab with a wet paint brush and squiggle on paper as shown. Do this same step for both the Neon Yellow and Neon Pink Pico’s. Flick some droplets across the panel with a wet paintbrush. Set aside to dry. 2. On a scrap of white cardstock, stamp image with Memento Tuxedo Black. Color in half a gumball with Neon Green. 3. 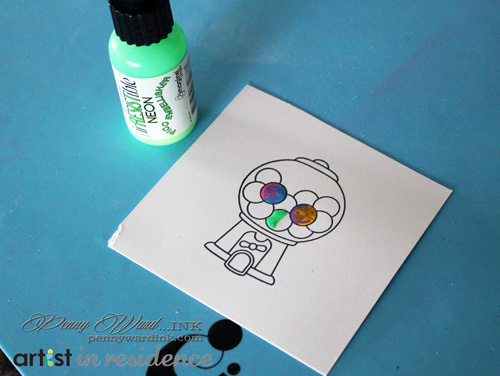 Color in other half of gumball with Neon Coral. 4. Using a toothpick, swirl the colors together. 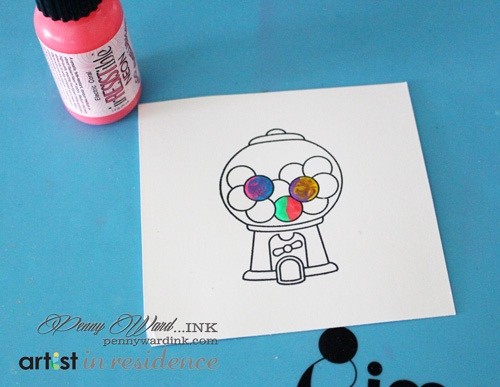 Do this technique for each gumball using all the Neon Pico colors. Let dry. 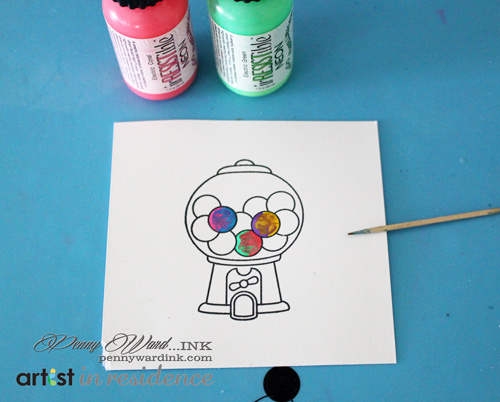 Color rest of Gumball machine with Memento markers and trim. 5. Stamp sentiment across watercolored area using VersaFine Onyx Black. Place washi tape along left edge of panel as shown. 6. Adhere watercolor panel to Yellow cardstock cut to 4.25 x 11 inches, folded in half. 7. Adhere Gumball machine embellishment with foam adhesive. Add sequins as desired.